I love Asian food and cooking. I love wok, I love sushi and I love Tikka Masala. Many people are afraid of cooking Asian because it sounds hard, but it really isn't! For example dumplings. It looks and seems complicated. Therefor I didn't dare to try and make some until just a while ago. It wasn't that scary actually. Took some time to do them, but it wasn't hard. 1. Mix the the flour and the salt in a bowl. 2. Pour the boiling water in and stir together quickly with the chopsticks. 3. Add the water and oil and mix until you have a nice dough. 4. Put some clinging film over the dough, place it in the fridge and let it rest there for an hour. You can make the stuffing in the meantime. 5. Just mix all the ingredients for the stuffing in a bowl. Place it in the fridge. 6. Boil some water in a pot. Place a mesh strainer and a lid on top (make sure the water is low enough not to touch the strainer even while boiling). 7. Take the dough out and roll it into a cylinder. Cut it in half and then cut the halfs in half, so you end up with four equally big parts. 8. Roll the dough out using a baking roller. Use something round (like a glass) with a diameter of around 8 centimeter, to cut out dough circles. Make about 7 from each quarter-dough piece. 9. Place a spoonful of stuffing in a wrapper. Fold the wrapper over the stuffing. Then take your finger and press lightly on the dough surrounding the stuffing to push out all the air. 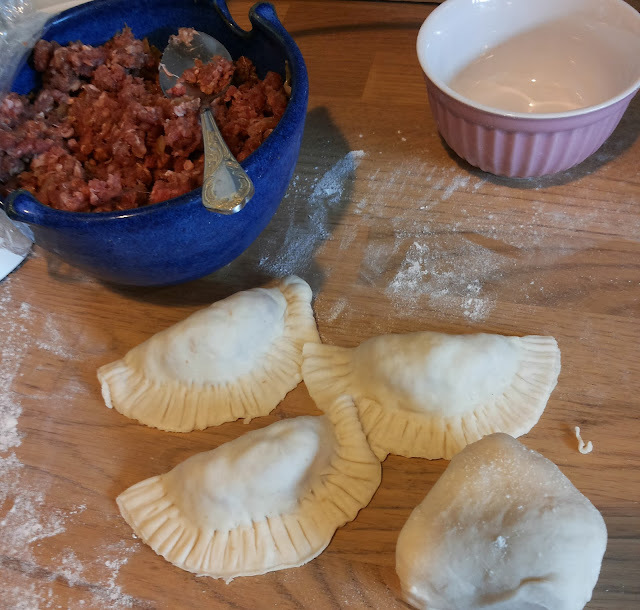 This is important, since the dumpling will break in the steaming process if there is air inside it. 10. Wet your finger and drag it around the edge of the wrapper before you seal it. 11. Take a fork and push it around the edge of the wrapper. 12. Place the dumplings in the mesh strainer (making sure that they do not touch) and put the lid on. Steam them for 15 min. You can serve them with rice and some soy sauce for dipping. I got the recipe form One Bite More, just made some minor tweaks to it. One Bite More is a wonderful food blog by the way!